If you're planning a trip to Mexico, you may need to make a call in advance to reserve a hotel room or get some information about tours or activities you're planning to do during your trip. Once you're there, you might like to call home to connect with your loved ones, or deal with any issues that come up that may need your attention. Making these calls may require the use of different dialing codes from the ones you're accustomed to. Don't worry, though - we've got you covered. Here's a look at how to dial to and from Mexico. The country code for Mexico is 52. When calling a Mexican phone number from the U.S. or Canada, you should dial 011 + 52 + area code + phone number. If you're calling a cell phone, you'll need to add a 1 after the 52, so you would dial 011 + 52 + 1 + area code + phone number. In the three largest cities of Mexico (Mexico City, Guadalajara and Monterrey), the area code is two digits and phone numbers are eight digits, whereas in the rest of the country, area codes are three digits and phone numbers are seven digits. For national long-distance calls within Mexico, the code is 01 plus the area code and phone number. If you're within the area code of the Mexican cell phone number you wish to call, you should dial 044, then the area code, then the phone number. Mexican cell phones are under a plan called "el que llama paga," which means that the person who makes the call pays for it, so calls to cell phones cost more than calls to regular land line phone numbers. Outside of the area code that you're dialing (but still within Mexico) you would first dial 045 and then the 10 digit phone number. To call a Mexican cell phone from outside the country you would dial as if to a land line but adding the 1 after the country code:: 011-52-1 and then the area code and number. If you're adding a Mexican cell phone to your Whatsapp contacts, instead of adding 011, you should enter a plus sign before the country code, then a 1 before the area code and phone number. More information about using a cell phone in Mexico. Although pay phones are becoming less common in Mexico, as in most places, you should still be able to find them around if you look carefully, and they offer an inexpensive way to contact home (or make a call when your cell phone battery is dead). Many pay phones are located on busy street corners, making it difficult to hear. You can also look in large stores like Sanborns - they'll often have a pay phone near the public restrooms - and they tend to be much quieter. Phone cards ("tarjetas telefonicas") for use in pay phones can be bought at newstands and in pharmacies in denominations of 30, 50 and 100 pesos. Public telephones in Mexico do not accept coins. When buying a phone card for pay phone use, specify that you would like a "tarjeta LADA" or "tarjeta TELMEX" because pre-paid cell phone cards ("TELCEL") are also sold in the same establishments. 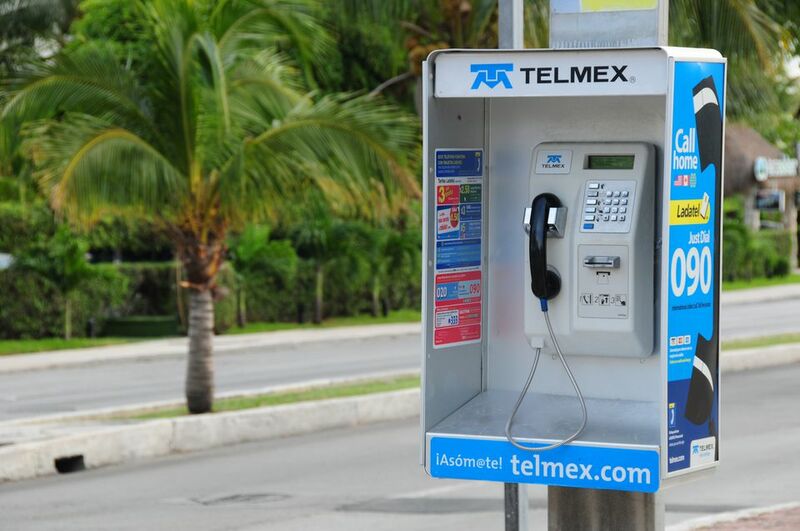 Calling from a pay phone is the most economical way to call, though long-distance phone calls tend to be more expensive from Mexico than from most other countries. Other options include calling from a "caseta telefonica," a business that has telephone and fax service, or from your hotel. Hotels often add a surcharge for these calls, so they're not the best option if you're traveling on a budget. Keep these phone numbers close at hand for any emergencies that might occur. You do not need a phone card to call 3-digit emergency numbers from a pay phone. The emergency number used to be 066 but Mexico has switched to 911 so that they are using the same system as the United States and Canada, so for any emergency assistance you can dial 911 to get an emergency operator who will transfer you to the appropriate service. Also see what to do in an emergency in Mexico.